Fantasy runway look, featuring Gerbera daisies, anthuriums, and gloriosa lilies. This year I had the pleasure of attending the 11th Anniversary of Hats in the Garden fundraiser in Naples, Florida. This event marks the start of the Naples social season and was held in a luxurious tent at the Naples Botanical Gardens. All guests were impeccably dressed in the latest fashions fit for an exclusive party in the Garden of Versailles! The women took pride in selecting unique hats and fascinators to top off their runway ready ensembles, while lunching and viewing a unique fashion presentation. “Hats,” as it is referred to by the locals, was particularly special this year. The official title of the show was Couture et Fleurs: Runway Fantasies Inspired & Created from Nature. It featured amazing couture designs from the likes of Naeem Khan and Carolina Herrera that were generously provided by Saks Fifth Avenue. 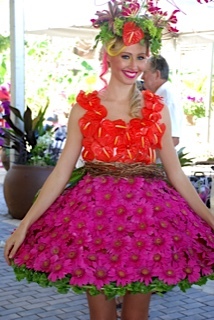 The highlight of the runway show, however, was the botanical garments created by top local floral designers. “Hats” was at its all time best this year. I am looking forward to seeing what they have in store for 2015!